Curious about Ayreon? Read on! AYREON was born two decades ago Arjen was suddenly and inexplicably overwhelmed by a compulsion to create rock-operas. This was back in the 1990s, the era of grunge and alternative rock, so the idea of releasing a rock opera was unthinkable to most sensible people. Yet history has shown that Arjen’s creative impulse was not only a personal triumph, it spearheaded a whole new era of rock operas. Every artist I contact has to be into Ayreon from the start. They have to be excited about my music, share my vision for the project and want to get involved emotionally as if it were their own. If I get the impression that they’re only ‘in it for the money’ or publicity, I will ask someone else. I simply can’t work like that! Musically, Ayreon albums tend to be characterized by extreme opposites: brutal guitars cut to lighthearted mandolins, classic roaring Hammonds collide with screaming digital synths, and dark death grunts battle angelic Celtic voices. The dramatic concepts range from fantasy (Actual Fantasy) to science fiction (01011001) to the inner landscape of human emotion (The Human Equation). The Final Experiment (1995) is Arjen’s first rock opera. The full title is ‘Ayreon: The Final Experiment’ with no band-name given. Later on the label suggested the name Ayreon would be used for any similar projects by Arjen. Actual Fantasy (1996) The second CD released under the Ayreon name is ‘Actual Fantasy’. It has no continuous story with a beginning and an end; instead, the CD’s entire concept is fantasy. The songs are based on fantasy and sci-fi movies, or on stories Arjen wrote himself. The first ten thousand copies of Actual Fantasy featured a bonus CD-rom track; a full-length animated video clip for ‘Stranger From Within’. The second version of the CD featured two bonus tracks: ‘The Dawn of Man’ and the single version for ‘Stranger From Within’ replacing the video. The third Ayreon release is a 100+ minute double CD and like ‘The Final Experiment’ it tells a continuous story. Eight archetypal characters from different historical eras suddenly find themselves in another dimension, where they are subjects in an experiment being conducted by an alien race. ‘Into The Electric Castle’ is the most pleasant sounding album I’ve made so far’, says Arjen. “And that is mainly due to the analog equipment I used. Like vintage synthesizers from the 70’s, which still have that warm, instantly recognizable sound. I had enough of triggered drums, samples and prefab digital sounds. I’m a sucker for contradictions. ‘Into The Electric Castle’ is one to start with. But I also like the idea of telling a sci-fi story and using equipment that – in some cases – people might find out-dated. Universal Migrator Part One: The Dream Sequencer & Universal Migrator Part Two: The Flight of the Migrator (2000) The Universal Migrator parts I & II were released at the same time, but sold independently. Part I: ‘The Dream Sequencer’ mainly features laid-back, atmospheric material with songs focusing on melody. Initially the album was meant to feature female singers exclusively. However, not enough singers were available so Arjen changed his plans. Whereas ‘Into the Electric Castle’ has an opera-like set up, in which main characters sing dialogues in one song, on ‘The Dream Sequencer’ Arjen chose to have only one vocalist sing each song. As a result each new incarnation of the last Colonist on Mars, the main character of the story, has its own distinct personality. ‘Ayreonauts Only’ is a collection of previously unreleased Ayreon and Ayreon-related material. Initially it was sold at a discount price and intended to appeal specifically to die-hard fans of Ayreon. Some tracks feature Ayreon songs sung by different singers than the original versions, and other tracks are completely different (demo) versions of songs. The CD also features a preview of Ambeon, a new project that Arjen had started after finishing The Universal Migrator albums. In May 2003 Arjen managed to wrap up all Star One business, and retreated into his Electric Castle studio to work on the 6th Ayreon album called ‘The Human Equation’. First of all I decided to only work with musicians who had never guested on Ayreon before. The one exception to this rule was the use of drummer Ed Warby, for he had truly become a part of my sound and music. I chose a wide variety of singers from different styles of music and from all corners of the world, most of them quite original and surprising choices, I think. For details on how the recording sessions went, please take a look at the studio reports available on the website. I will tell you one thing: just as on ‘Into the Electric Castle’ there is a lot of ‘dialogue singing’ again; sometimes one song features up to ten different singers! On 01011001 Arjen brought back the sci-fi concept and managed to link all his previous albums together, musically as well as lyrically. The album features 17 vocalists, and to make the most of them Arjen returned to the style of having several characters exchanging lines of dialog in each song. Lyrically, 01011001 is darker and perhaps more enigmatic than The Human Equation. In addition to the sci-fi elements, the lyrics also deal with the very human issues of dehumanization, over-dependence on technology, and the fear of losing one’s capacity for emotion. People often ask Arjen to name his favourite Ayreon album, but it’s impossible for Arjen to choose from amongst his “children.” So you can imagine what a difficult time he had choosing the tracks for the first-ever Ayreon compilation album! TIMELINE follows the thirteen-year evolution of the Ayreon sound from the 1995 debut The Final Experiment to the release of 01011001 in 2008. Its 3 CDs contain 32 essential Ayreon tracks plus one brand new song recorded especially for the compilation — almost 4 hours of music! 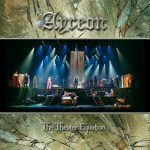 In September 2015, over the course of four sold-out shows, Ayreon’s legendary progressive rock concept album ‘The Human Equation’ was brought to life as a full-blown musical production at the Nieuwe Luxor Theater in Rotterdam. The stage show stars Dream Theater frontman James LaBrie in his original roll as “Me” and features nearly the entire cast of vocalists from the original 2004 album. The main cast is supported by the 19 members of the Epic Rock Choir, which was put together specially for this event. After Arjen departed the Transmission label prior to The Human Equation release, Ayreon found a new home at InsideOut Germany. All the Ayreon albums had been sold out for quite some time, so InsideOut had to repress them all in order to have any stock to sell. For this occasion Arjen created special editions. In early 2016 the Ayreon back catalog (i.e., all albums except for The Theory of Everything and the Theater Equation) was transferred over to the Mascot Label Group. New re-releases are expected throughout 2016. In October 2016 Arjen officially announced that he was working on a new Ayreon album, scheduled for release sometime in 2017.